Researching a place is a key element to starting each project. Personal observations and interests are overlaid with the research, which can take the form of conversations and books as well as visits to places that are interesting to me. For this installation the exploration and photographing of the city of Dayton and the surrounding area produced a number of images: derelict garden pavilions, a burned-out amusement park, wooden gateways and the stone locks of a former canal. The use of vernacular images draws attention to the visual dimensions of our environment. It also provides a means of access to the projects as a source of recognition or familiarity for the viewer. The site is a forested hillside in a city park. The first element is an elaborate gateway in a wooden wall. The gateway, also a sitting pavilion, frames a view up the hill. This operation of framing makes something visible – in this case the woods – by setting it apart. The gateway also sets up a procession by means of a sequence of narrowing gates that are like the wings of a theatrical set; The gates configure a passage which acts as a formal entry to the wooded area of the park. The fixed perspective of the initial view is contrasted with the experience of walking through the gates. 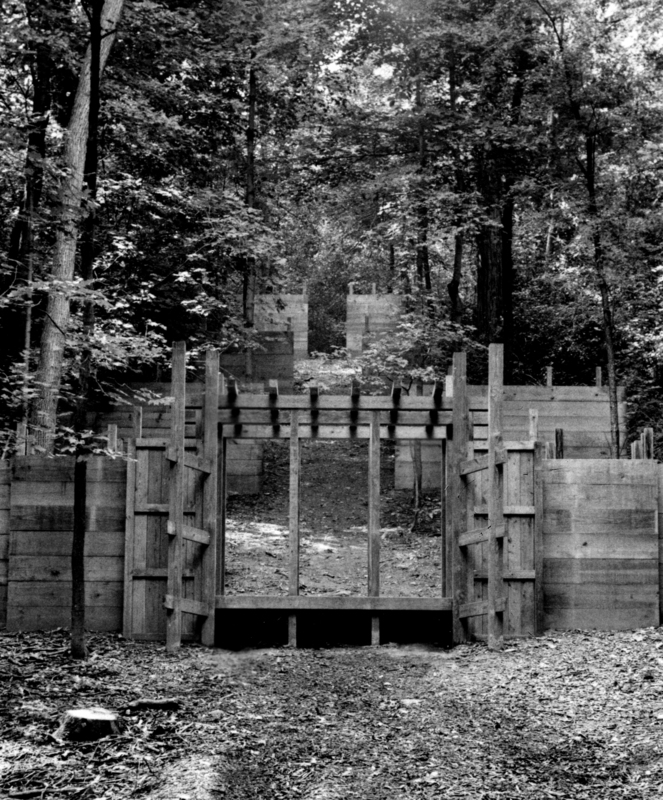 The difference between the pictorial view of a space and the movement through it is noted as the visitor passes beyond these introductory structures into the woods. The temporal duration/sequence of the work enables the viewer to luxuriate in the view, hold it in place, become part of it. Woods, usually noted only as a uniform band or backdrop, become specific.